Popups on every page you visit asking to upgrade and I mean every page you visit. Not a real giveaway. And the DNS leaks so you are not protected. This software leaks the DNS in the background. If you’re using it and you think your hidden, you’re not. There are several DNS leak test sites on the Web to test this if you have doubts. Hello everyone. Thanks to AP87 for his information. 1. There appears to be no P2P torrent support. The name of the company and software is seed4me, which strongly implies that the company and software are built upon seeding, presumably torrents, which the software doesn’t support “to anonymize; you can still torrent, but most users will be under the misapprehension that their IP is hidden”. This means that SOMEONE other than the user is seeding something with this software, most likely the company. My guess is that the company chose this name to market to other companies who pay for seeding adverts by injecting outside info into the stream after obtaining target information from user traffic. 2. This brings me to my next objection: the Terms of Service are Draconian (that is being nice) at best. I HIGHLY ENCOURAGE EVERYONE TO READ THE TERMS OF SERVICE FOR THIS SOFTWARE PRIOR TO INSTALLING. If you read the excellent post by user AP87 in the reviews section for this software (you are currently in Discussion, not reviews), he goes into great detail about the horrible TOS. You can read those reviews at this link (look for user AP87) https://sharewareonsale.com/s/free-seed4-me-vpn-100-discount#submit_review. In his excellent review of the TOS, there is one part that should make your hair stand on end. While there are plenty of other parts of the TOS that alone would give me great pause about this software, this particular part easily decided for me to NOT INSTALL. They reserve the right to INSTALL, MANAGE AND OPERATE ONE OR MORE SOFTWARE…OR OTHER SOLUTIONS.. They are saying they have the right to install ANYTHING on your computer that “(they) consider to be illegal or violations”. Note that it doesn’t say IS illegal or violations, but what (they) consider. So if someone at seed4me CONSIDERS (opinion) there MIGHT be a TOS violation, they can install any software they want, as long as it, in their opinion, will “assist us in identifying and/or tracking activities that we CONSIDER to be illegal or (TOS violations). If you install this software and thus agree to the TOS you are essentially authorizing the company to “manage or operate” ANY software they want on your device. I would like to thank ASHRAF for an outstanding site that I use almost daily and for not censoring user posts. He has always exhibited the utmost integrity regarding this. Finally, I would again like to acknowledge and thank sharewareonsale user AP87 for going through the TOS and finding these landmines. Please read his post: it is incredibly informative, detailed, and alarming. Worst VPN ever. Full with advertising, bad connection, slow speed. Seems very nice; however, as usual with these kind of service-providers …. – Posting to or transmitting through the Seed4.Me Service any unlawful, harmful, threatening, abusive, harassing, defamatory, vulgar, obscene, profane, hateful, racially, ethnically or otherwise objectionable material of any kind, including, but not limited to, any material which encourages conduct that may constitute a criminal offense, give rise to civil liability or otherwise violate any applicable local, state, federal or international law. .. as with all these providers, trust in them and their accountability is main prio for the end-user. .. waiving all responsibilities in case of any such events, also on behaolf of third-parties; thus, enabling them to among other things excuse something such as the above example with traffic-manipulation as, “oh, sorry guys, that was a third-party advertising agency” that was hacked/went bad/.. , sorry to those affected but feel confident of our commitment to your security by knowing we’ve now closed their access.” .. or some nonsense as such, presumably third-party — likely non-tracable / non-accountable, such as themselves anyway — to distance themselves for anything bad. – it may be safer to use your home-connection , even if you are engaging in illegal torrenting. Besides not as surely having that logged with such broad authorizations and rights-waivers without even any sort of privacy-governing data-retention policies laid out whatsoever, can feel confident that at least not some “free” service-provider does not log all traffic-data (who would know anyway they aren’t responsible for any of it; you already acepted that if you signed up..), or possibly worse yet , inject malicious data for shady uses of all kinds…. n, surely many may call me some paranoid freak , talking non-sense..blablabla.. may be. “free” .. put some consideration into how and why. is this a charity, doing this to be nice to random unknown people whilst not wanting to disclose who they are .. some secret santa of sorts? lol. the question is their main means for monetizing and funding such operaetion … which to me has too many potential security-aspects (for the end-user) being , eh, I’d say , potentially “quite bad” , that I would trust me network and data-traffic with such unknown entity as easily. Certainly, still, this sort of service _does_ have its uses, in many ways and for numerous reasons..
Just wanted to add, this may have a lot of uses still – despite, assuming all worse-case scenarios such as some of which were described in my first post, given all were true…. (which, we can only hope it ain’t, or at least not every part of — and/or worse yet. lol .. o_@ ), might still be found of use and a resource to many, for many purposes and in numerous ways… given preparation and precautionary measures being taken. Hopefully, though, they’re just being really nice and giving everyone free stuff and idd. only having source of income through the continued servicing of their vpn-service as stated by satisfied users who remain with t hem after this initial period and decided to become paying customers. That’d be nice. Thank you. I decided to veer towards safety on this one- I’ll skip it. 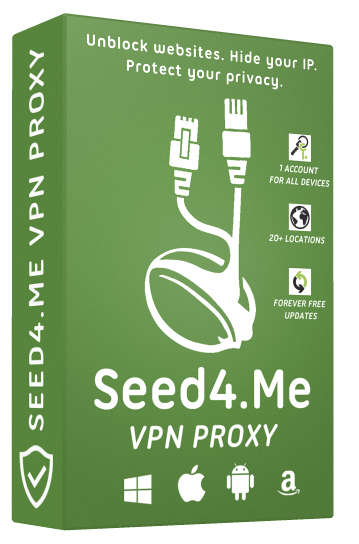 This is Alex from Seed4Me VPN. Thank you for your notes. You have done rather deep conclusion only by reading a single page. This page is a standard “terms of service” you can find on almost any whitehat VPN/proxy/any online service website. Yes, we require not to break the law of the country where the VPN node is located. Torrent are allowed in Switzerland and Sweden. We do not log or DPI traffic. We earn on paid subscriptions and we have our own advertising platform where ads a strictly moderated: we will never advertise or make you to install malware or something that may harm users PC and users privacy. The only thing you maybe offered to install is Seed4Me updates. Please, feel free to ask me any questions regarding our service! This is great, thank you, I am also proud that this is your country’s victory. Your developers did an extraordinary job. I’m really happy with all the kids. Provide the best software for users. And we use it safely. Amazing! Unlike other apps, uncomplicated! This app is very easy to use! Congratulations to the company experts. Very Good, No Ads, No Crash, No Bug, Just Great! Thank you. Thank you for making such a beautiful product. This Software more than 5 stars. Thank you for using Seed4.Me! FAKE REVIEW; FAKE REVIEW;FAKE REVIEW !!!!!! Not only is that post fake, it’s one of the most poorly worded, stupid sounding reviews I’ve ever read. That review alone will ensure I never run this piece of software. I think the speeds are slow and the ping is too high. I don’t know for others, but it’s not for me… Sorry. Please let me know what VPN location did you choose and how far is it from the place where you are? We would love to help you to find the fastest server for your needs, please, answer us here on SharewareOnSale, or drop us an email — support@seed4.me.